The project, which started in 2013, is to replace the 103-year-old steel grating-decked bridge that spans the North Saskatchewan River with a double 56m-high steel arch. The new Walterdale Bridge will feature three northbound traffic lanes and a separate shared-use path on the east side and a sidewalk on the west side. ALE was contracted by Acciona Pacer joint venture to carry out the skidding, navigation and heavy lifting of the main arch, which had been previously assembled by crews on the south bank of the river, as well as the lifting of the final assembled arch. The skidding and navigation of the central section began in November 2015 when an external ballasting system and two modular pontoons were used to transfer the load onto the river. The skidding was carried out through the combination of an onshore, skid-shoe system with a four-winch mooring system on the barges. The challenging process involved transferring the load of the arch from the towers to hydraulic supports, and then onto the first support barge. After further sliding onto a second barge, the load was fully transferred onto the barges from the hydraulic support. 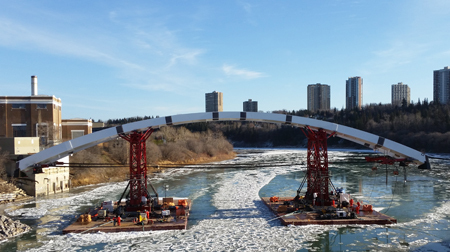 Once the skidding was completed, the arch was transported to its destination along the North Saskatchewan River by the barges, which supported the load through interior steel supports under the arch. After navigating into position, the load of the double arch was transferred from the barges onto climbing jacks that subsequently completed the 15m vertical lift in around five hours. In April four strand jacks lifted the fully assembled, 2,000t arch by 20m to its final position. The new bridge is scheduled to open to traffic by the end of 2016, with overall project completion by autumn 2017.